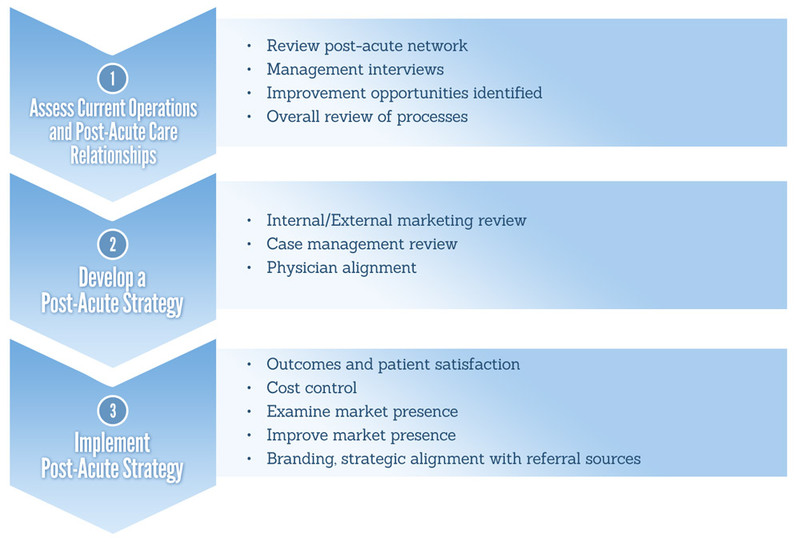 Our post-acute care alignment consultants assist clients in evaluating their current post-acute care strategy and network to assess how effective it is in improving outcomes, lowering costs (through reducing average length of stay [ALOS] in the acute setting and curbing re-admissions), and reducing leakage of patients outside of the organization’s network. We then design a plan to execute this strategy, and our experts ensure an organized and results-driven post-acute care implementation to provide a more streamline patient care continuum. We utilize high-leverage interventions to ensure that you receive results. With our expertise, we will provide you solutions to maximize results.